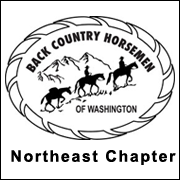 The Northeast Chapter is a Chapter of the Backcountry Horsemen of Washington: We are a state organization of Backcountry Horsemen of America Inc. (BCHA), in 25 other states. Come join us for good friendship, good information, volunteer opportunities, and the chance to make a difference! See our website and Facebook page for additional details and photos.